My girls and I are all doing Harry Potter themed costumes for Halloween this year. I had so much fun putting them all together! 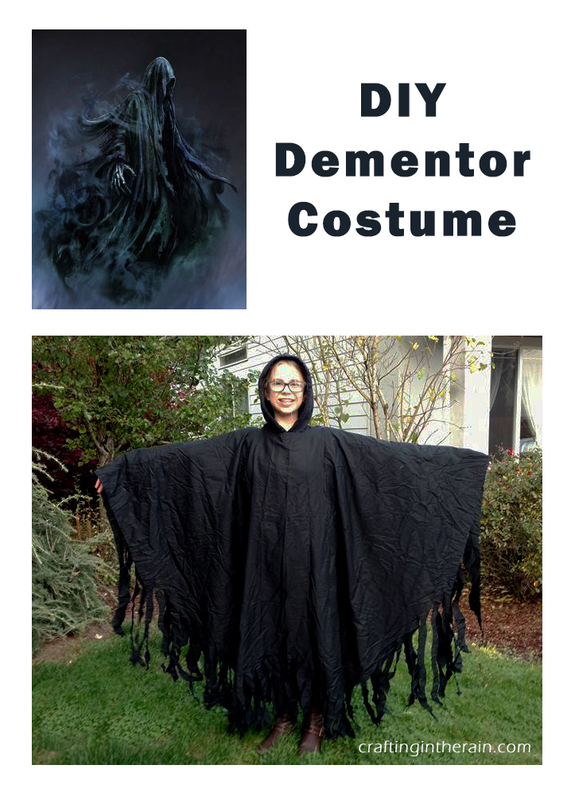 I couldn’t find any dementor costume tutorials when I looked online. And the reviews for any I found available for purchase weren’t great. So it was time to put something together myself. 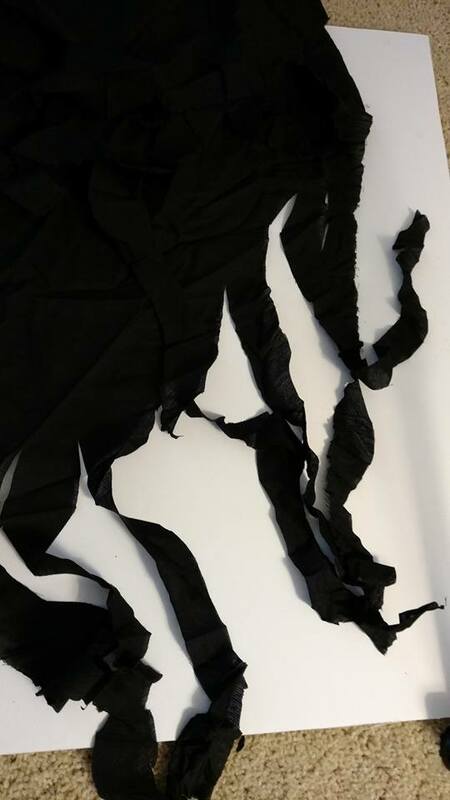 Plus, now there IS a tutorial for a DIY dementor costume, and you just found it! Start by folding the sheet in half the “short” way. Mark the center of the fold line and cut a half circle through both layers, about 6 inches in diameter. This is where the head will go. Try it on your costume wearer and make sure it fits easily over their head. Have them stand with arms stretched out to their sides and mark with a pin about 10 inches down from their arm. This is so we don’t cut the raggedy edges up too high. Cut wavy lines to make strips in the bottom of the fabric like this. You end up with a drape-y, flow-y fabric that swooshes around when they walk, and it’s just perfect. **If the strips are too long for your kiddo and will be a tripping hazard, just cut them shorter off the bottom. I went to the thrift store and just started looking for all things pink! I found a fuzzy pink sweater and just cut it up the middle in the front to turn it into a jacket. I hot glued a collar (the cut-off bottom part of a knit cardi) around the collar of a plain pink T shirt. Then she had a toy cat to hold. The only thing that could have made this any better was if I’d found a pink skirt. But since I didn’t the pink pants she already owned worked great. For my Professor Trelawney costume at the thrift store I found this gem of a skirt. The rest of the costume is easy! 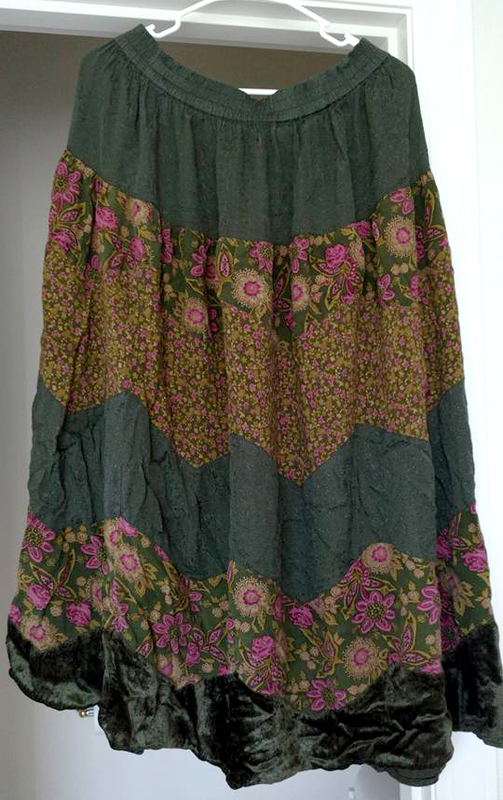 So look for a long skirt that’s green and brown. Kind of ruffly or striped like this is perfect of course. 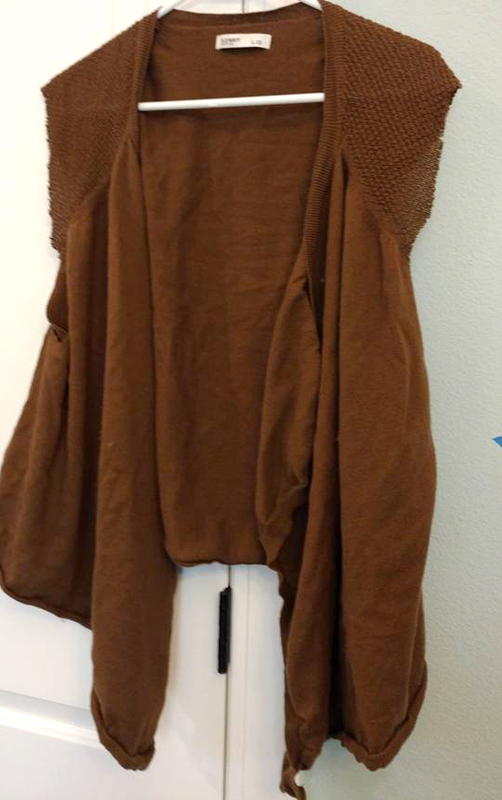 Then I also found a plain green Tshirt and a brown cardigan. I cut the sleeves off the cardigan to make it into a vest and then used one of the cut-off sleeves as a head band in my hairsprayed-frizzy hair. Add a couple of long necklaces if you want, and then find some circle shaped glasses. I ordered these round “bug-eye” glasses from Amazon, and they actually are kid sized instead of adult (yeah, read the comments 🙂 But they fit on my alright. Just be aware that they do mess up your vision! You could also find any big round glasses and even remove the lenses so you have plain frames to wear. Anyway, I hope you like all our costumes this year. 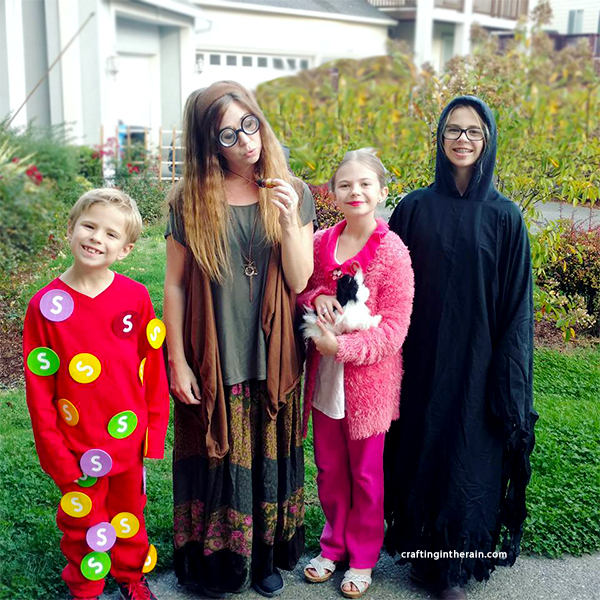 Click on this post to see the Skittles costume.